We all know for a fact that finding a gift for a family member or someone close to you is difficult. Besides, we want to make the gift special in order for the person receiving the gift to truly appreciate what you’ve given them. For starters, you should always keep in mind that you want to give something that is practical enough in order for them to actually use it and also get pleasure from it. You will also want to give them something special that they will be able to remember it for a long time. Even if you don’t really have a lot of money to buy a very expensive gift, you will see that there are ways on how you will be able to create a gift that they will truly appreciate and one that will really look elegant and classy. One great example would be giving a wine gift basket. The great thing about this gift idea is that you don’t have to spend a lot of money on it. You may need to spend some money on the wine itself but you will see that the entire project is really not that expensive. Also, you really don’t have to have any great knowledge about wines to do this. Try to start simple by choosing a great dessert wine or champagne. You really can’t go wrong with this as wines and champagnes will go great with dessert and chocolates. Besides, if you ask anyone about it, they will surely say that they love chocolates with champagne or wine. Even if they don’t love it, they will still be able to share it with someone who does. Now that you have the dessert wine or champagne, the next step is to spice things up a bit and make it look great. You need to remember that giving the champagne or wine with the chocolate alone will not really cut it. You have to please the eye in order to please the person you are giving the gift to. All you need to do is go to the nearest dollar store and get a basket that looks great but doesn’t cost a lot. You can fill the basket with pieces of crumpled up tissue paper. Go for white and red paper as this goes well with the design theme of giving wine and chocolates. Next, you have to get a ribbon of the same color in order to decorate the handle of the basket. The first step in creating a wine gift basket is to place the champagne and chocolate in the basket. For the chocolates, you can choose to buy a bag of separately wrapped chocolates or a couple of small boxes of Belgian chocolate truffles. A box of assorted chocolates will also be great. A wine opening tool or a corkscrew is a great addition to the entire mix. 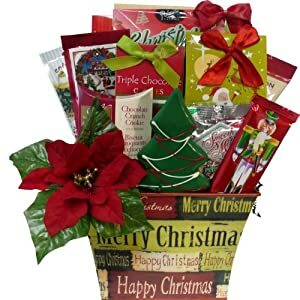 Wine gift baskets is a great gift idea for men but you will find that plenty of women will also appreciate this kind of gift. Lastly, you should put in a card. A simple card with the appropriate theme for the occasion will add a little more personal note from you to the receiver. 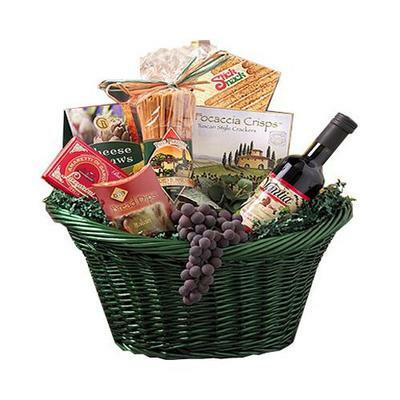 Wine gift baskets are great for any special occasions. With this, you can be sure that you will be able to please anyone you give the gift to.